My must have summer fragrance | Almost Chic. Perfume is so important to me; some of the best and worst experiences of my life can be brought back to me just from a passing whiff of the right fragrance. Every summer I love spending time selecting the perfect scent as I know I will come to associate it with all the fun memories I have in the sun. Instead of having a soundtrack to my summers - I have a scent index! 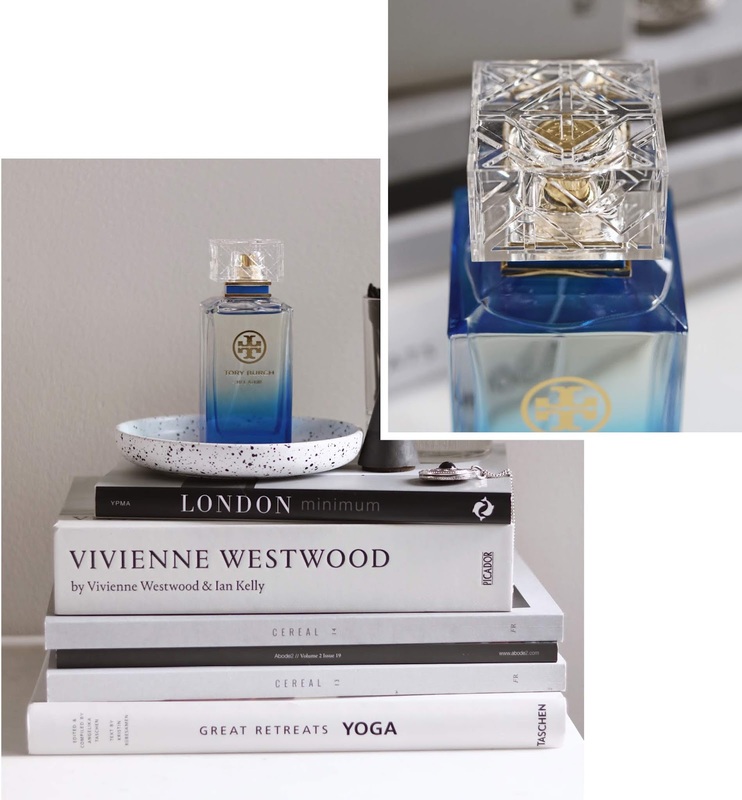 This is designer Tory Burch's second foray into the perfume world after the success of her debut fragrance, Love Relentlessly. Whilst her first perfume was inspired by the feeling of falling in love, her new scent Bel Azur takes inspiration from the Ocean; evident in the gorgeous blue ombre bottle and fresh summery scent. Not only does this perfume look stunning on my dresser, a big factor for me when picking a perfume because I'm all about aesthetics basic, but it smells stunning too. I'm not a fan of heavy floral perfumes so Bel Azur ticks all the boxes for me. It's delicately floral (not the kind of floral that makes you want to sneeze) and since it's so light, clean and fresh I think it's the perfect summer scent. I've been wearing it for a few weeks now and it is one of those perfumes that gets compliments wherever you go and you kind of don't want to let everyone in on the secret. Hints of Bergamot (my favourite scent in anything) Neroli and Peony make the scent playful and fresh while a wash of cedarwood and earth vetiver keep it sophisticated. A fabulous all rounder that's great for days on the beach or date night with bae. I'm totally obsessed but a drawback for some might be longevity. As with many light fragrances Bel Azur can fade quite quickly. I'd say after about four hours it is pretty faint and needs to be re-spritzed. Personally I don't have an issue with this as I find the type of perfume that has the lasting power to stay strong all day are also the ones I tend to find sickeningly overwhelming. However, I know some people object to buying high end perfumes whose scent doesn't last all day so if you fall into that category it's maybe something to consider before you splash out. Available for £99 (100ml) at House of Fraser it's certainly not a cheap treat but I use around two spritzes twice a day hence the bottle will easily last the summer. Plus this gorgeous bottle is definitely getting a decorative place on my shelf long after the perfume is finished since it's just too pretty to throw away (hoarder much?). Heck, it was hard enough to throw away the packaging. For me, it is worth the splurge. If you fancy picking up a bottle to scent your summer memories you can shop it here. Bel Azur is such a lovely scent! I've got a tiny tiny sample bottle that I've been using lately and definitely thinking about picking up a full sized version too since I absolutely love the scent!